The Director of the Vietnamese Archives Dan Thant Tung said on Monday in Havana that it is regrettable to hear the recent decisions of US President Donald Trump of reinforcing its blockade against Cuba. He told ACN that it is deplorable to hear about Washington’s changes which were previously more feasible between the two nations, referring to the setback in the recent announcement of the US President on the process of normalization of mutual relations. 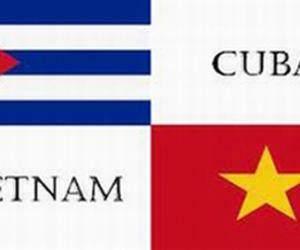 Master in Science, Marta Marina Ferriol Marchena, Director of the National Archives of the Republic of Cuba (ARNAC) agreed with her Vietnamese colleague in that the new dispositions are a return to the Cold War after both sides were able to begin a process of respect. Ferriol Marchena and Thant Tung signed on Monday a letter of intention aimed at organizing activities on the occasion of the 60th anniversary of the establishment of relations between Havana and Hanoi. According to the document, an exchange of experts is foreseen, joint exhibitions in addition to negotiations in storing information via email. Thant Tung is Master in Science and originally from the Port of Haiphong, where the US attacks began in 1972 against North Vietnam. This is his first visit to Havana heading a delegation that will hold talks at the Ministry of Science, Technology and Environment and the Office of Historic Affairs of the Council of State. The ARNAC has the largest testimony on the history of the Cuban nationality and was founded on January 28th, 1840 with the name of the Real Hacienda General Archive and is the 5th of this type of institution created in Latin America, after Argentina (1821), Mexico (1823), Bolivia (1825) and Brazil (1838).